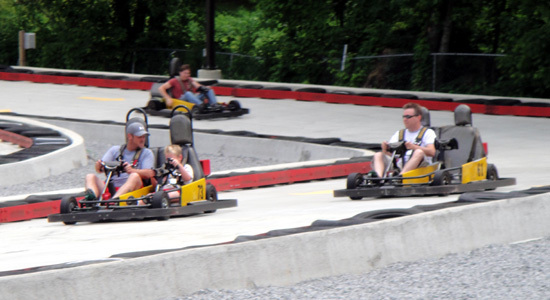 Today we were off to the nearby fun center for miniature golf and go carting. First we all hit the fantasy golf. Tommy, Sarah and I played together. Tommy and I were in close competition. In the end he finished one stroke better than me. Sarah played hard, but came in third in our group. Up next was some serious race action one the track. It only took me one lap to figure out that these cars were tuned down so much that there was no need to lift out of the gas or break going into the corners. In our first race I started last but I quickly learned that I had the best car on the track. I spend about half the race beating on Alex's bumper trying to get him out of my way. These cars just don't have the power to pass on the outside. Eventually I did push Alex to the side. I had to bump a lot of people out of my way. and by the end of the race I was up front. Not that I was the best drive, I just had the best cart. During most of the second race I was all over the back of Tommy and Colton's cart. I couldn't get him out of my way. As hard as I was beating on them I couldn't get them to spin out either. In the third and final race the tables were turned. Tommy spent most of the race pushing me around the track. I was determined not to let him pass me or to spin me out. I made my slow cart as wide as I could and blocked him at every corner. At the checkered flag I was ahead of him. Kelly, J.R, Justin, Hannah. and Sarah finished up with another round on the golf course. Once back at the campground, we hit the creek for more tubing. But now the creek was up from water being released from the dam upstream. The current was stronger and the water was colder. But we still had a good time. The evening meal was beans. Lots of beans. A pot of 15 different beans that had been cooking on the campfire all day. And of course you can't have beans without cornbread. Click here to see my pictures from Mohican State Park.